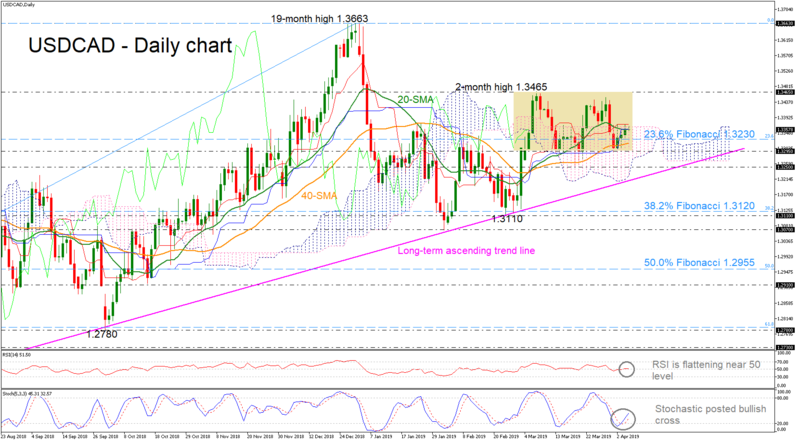 USDCAD, has gained some momentum this week and rebounded around the 1.3295 support for the third time since the start of March and is trying set to exit the Ichimoku cloud. Moreover, the price found strong obstacle around the 20-day simple moving average (SMA), while it is holding above the 23.6% Fibonacci retracement level of the upleg from 1.2250 to 1.3663, around 1.3230. However, in the short-term, the pair hovers within a narrow range of 1.3295 – 1.3465. The technical indicators are feeding prospects for a marginally positive short-term. The RSI holds near the threshold of 50, however the stochastic completed a bullish cross within the %K and %D lines, suggesting upside tendency. Also, in Ichimoku indicators, the price found strong resistance near the red Tenkan-sen line. Further improvement may lead the price towards the two-month high of 1.3465 and a successful penetration of this level could drive the market until the 19-month high of 1.3663. In addition, the bulls would need to clear this level to push the rally until the 1.3790 peak, the highest level registered since April 2017, confirming the recent long-term view. Alternatively, a failure to overcome the upper surface of the Ichimoku cloud, would send the price back down to the 23.6% Fibonacci of 1.3230 before touching 1.3295. Lower, the 1.3250 and the ascending trend line could halt downside movements, but if not, then more losses could follow, probably towards the 38.2% Fibonacci of 1.3120, shifting the bullish structure to neutral.